Earlier topic: Kingsley Foil Stamper-Help! Is your arrow pointing to the side arm of the press? It should just slide right off as long as you pull straight away from both the platen rocker and rear yoke. You can’t pull one side more than the other or it’ll bind up. If you’ve got a fair amount of rust you might need to do some cleaning of the shafts prior to removal… and then some gentle coaxing with a rubber mallet. If your arrow is pointing to the side frame the entire press needs to be disassembled. 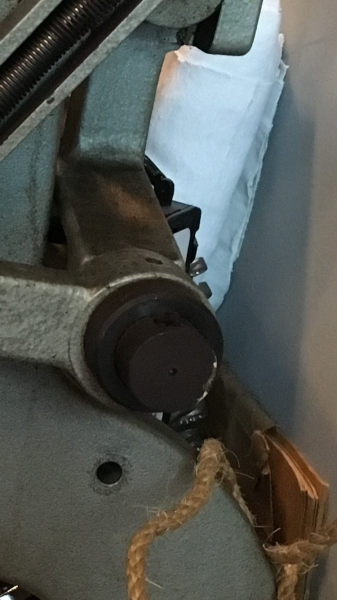 The difficult element to remove is usually the roller frame, not because of the tapered crosspin but because the roller frame shaft may have a Dutch pin buried behind the roller shaft and spring. Some Pilot presses have them, some do not. After removing the cross shaft pin, one must tap the shaft through the roller frame. Keep in mind the that ink disc pawl must also be allowed to float in order for the shaft to clear the opposite side frame. Thank you so much for your responses! I will try removing side arm again. I’ve sprayed it quite a bit with some WD-40 … it just seems hard to pull off. 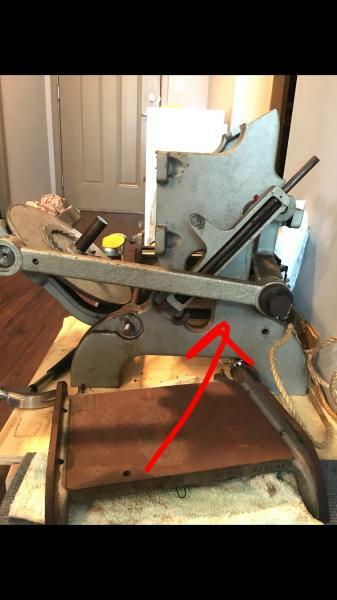 If you already have the opposite side, you may need to have someone support the platen so it relieves some of the weight on the side arm. That will also keep the platen from falling forward when the arm comes loose. If alone, just hold your body against the platen as you wiggle off the side arm. This is the part I am having trouble with… I’ve managed to lift the left side of the arm up quite a bit but I cannot figure out how to get this piece off. How would I take off the black circular bit? On mine there’s a screw on the black outer ring that, when loosened, allows the ring to slide right off. If you’ve loosened or removed the screw, and it still doesn’t budge, it might be stuck due to the rust. Spray a bunch of WD-40 in there and let that soak into the rust and try again. A last resort might be to get some kind of wedge in the gap between the ring and the arm, and tap it with a rubber mallet until it moves them apart and you can slide the ring off. @moe_szys1ak thanks so much! I see it now. I will get an Allen wrench and try to undo that. Thanks so much, everyone for your patience! I’ve been able to take that arm off!